State and Federal goals, policies, regulations, and laws that address bicycle transportation. Maintaining bicyclist safety, mobility and access through work zones. Applying transportation planning, traffic operations, and design “best practice” principles to maximize bicyclist safety and mobility and support “Complete Streets” policies. By the end of the workshop, attendees are able to more fully understand and apply guidance found in the State or AASHTO Highway Design Manuals, State or Local Project Development Procedures, State and Federal MUTCD (Manual on Uniform Traffic Control Devices), and other State and Local guidance documents, and implement State “Complete Streets” policies. 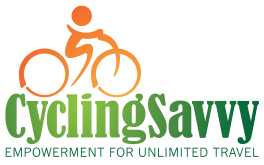 Describes key state and federal policies relating to bicycle transportation and access as well the critical need to go beyond minimum bikeway standards to support the safety and convenience of bicycling. 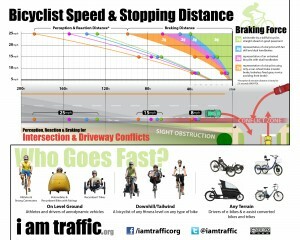 Describes the three fundamental individual behaviors behaviors: driver, edge and pedestrian. Knowledge of these behaviors is essential to understanding how the design and operation of streets and bikeways affect bicyclists. Most professionals are familiar with edge and ped behavior but may not be as familiar with bicycle driver behavior and its long heritage in law in the United States, and its importance to bicycle transportation on the existing road network. 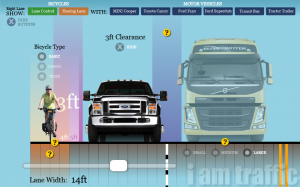 Not all behaviors in the spectrum are crash risk neutral at driveways and intersections – crossing conflict points – where most crashes occur, and this section describes the relative risks of each behavior in terms of visibility and movements. This section introduces the 6Es of bicycling support and focuses on the Equality (laws), Engineering and Evaluation, Es that affect transportation professionals in their work to support bicycling. This subsection introduces the 6Es, covers law and engineering basics, delves into CA traffic control and design requirements, gives an overview of bike lane standards, and also introduces shared lane markings (sharrows). This subsection examines bike lane and sharrow designs, that must go beyond minimum standards to avoid both the door zone and close passing hazards, and covers work zones, freeways and signal detection. It then goes on to discuss path designs and the challenges they present to cyclists and designers, covers evaluation, and concludes with a section dedicated to non-standard facilities. Introduces the important concepts of inclusive versus divisive designs and engineering, which either include multiple behaviors, or criminalizes one behavior to support another (or others), creating divisions within the cycling community. This exercise contains a series of facility photos which are exemplary of problems commonly observed in the field. It is designed to help the students to recognize proper/standard features and identify improper/non-standard features.